We are excited in introducing our first soup recipe. 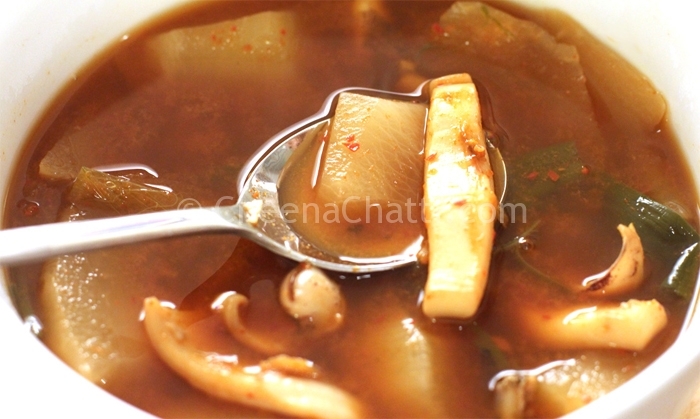 For a difference, we are sharing you with the exclusive squid soup recipe shared by our subscriber Shirly James. I am sure you all will love this sea food soup. Though it’s a very easy to make soup, it smells and tastes great. This is also great for a cold day or when you’re recovering from some illness. Directions for squid soup preparation. Clean the squid well and cut it into 3 inch x ½ inch strips. Slice the radish / turnips, carrots thinly into bite–sized pieces. Cut the green onions into 2 inch long pieces. In a soup pot place all ingredients and mix well with a spoon. Add 5 cups of water and bring it to a boil over high heat for around 15 minutes. Turn down the heat over medium and cook for another 25 minutes until the radish (will become translucent) / turnip is cooked. Sprinkle the coriander leaves (മല്ലിയില). Serve hot with more side dishes. Have you tried it? Then let me know your thoughts and comments on it. Want to learn more squid recipes? check these. This entry was added on April 15th, 2013 by Renoos in Non Veg and tagged with soups, soup recipes, squid soup, chinese soups, non vegetarian, squid, how to make squid soup, chinese food recipes, easy soup recipes. Last revised on March 28th, 2018. Recipe & Recipe photo contributed by Sherly James.